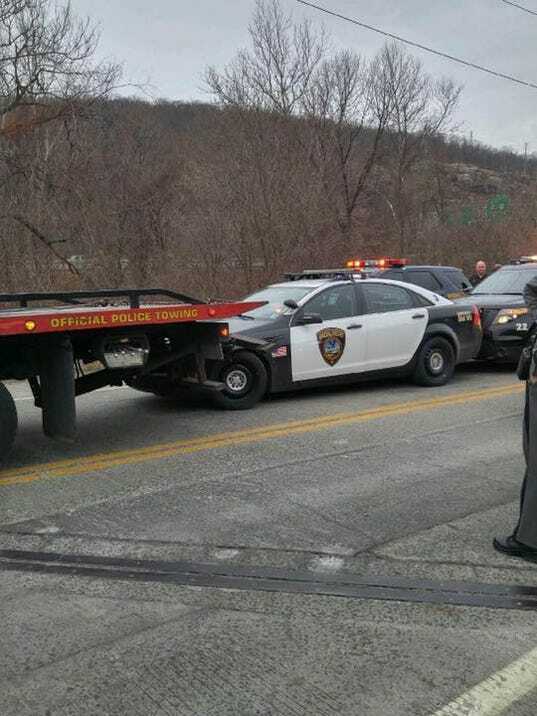 A man who stole a flatbed tow truck in New Jersey Monday morning led police on a two-state chase that ended in Ramapo, authorities said. Two New York State troopers were injured when their patrol cars were sideswiped by the fleeing flatbed, said State Trooper Dermont Summers. The driver of the stolen vehicle, identified by East Rutherford police as Paul Gudanowski, 51, of Hackensack, New Jersey, is facing charges in both states. The chase began in East Rutherford after 8 a.m. when police spotted the man driving the flatbed in an erratic manner on Route 120, close to MetLife Stadium. Another tow truck near it had tried to stop the stolen truck. When Gudanowski sped off, police from several New Jersey towns joined in a chase that went up Route 17 North into New York, where New York State troopers joined the pursuit. The truck entered I-87 northbound and left the highway at Exit 16 in Orange County by the Woodbury Common Outlet stores. It then made a U-turn, exiting the highway at 15A with more than a dozen police cars surrounding the truck. The truck came to a stop on Route 59 in Ramapo, near the border with Suffern, after an East Rutherford patrol car accidentally hooked onto the flatbed’s rear bumper. It is unclear whether other officers were also injured. Gudanowski was charged by state police with operating a stolen vehicle, assault on a police officer and numerous driving violations, Summers said. He is being held in New York until he is extradited to New Jersey, where East Rutherford police will charge him with aggravated assault and possession of stolen property.